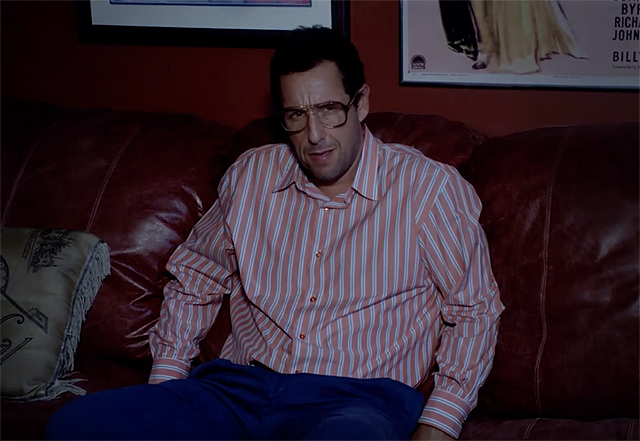 Netflix has revealed a new clip from Sandy Wexler with Adam Sandler kvetching about a music clip with Jennifer Hudson, which you can check out below! The new Sandler vehicle will play exclusively on the streaming service starting April 14, 2017. Sandy Wexler (Adam Sandler) is a talent manager working in Los Angeles in the 1990s who diligently represents a group of eccentric clients on the fringes of show business. His single-minded devotion is put to the test when he falls in love with his newest client, Courtney Clarke (Academy Award and Grammy winner Jennifer Hudson), a tremendously talented singer who he discovers at an amusement park. The Netflix original film also stars Kevin James (True Memoirs of An International Assassin), Terry Crews (Brooklyn Nine-Nine, Ultimate Beastmaster), Lamorne Morris (New Girl), Nick Swardson (The Do-Over), Rob Schneider (Real Rob, Grown Ups), Jane Seymour (Wedding Crashers), Grammy winner Aaron Neville, Arsenio Hall and more. The film is directed by Steven Brill (The Do-Over). Paul Sado, Dan Bulla and Adam Sandler wrote the script. Happy Madison Productions’ Adam Sandler and Allen Covert serve as producers. Barry Bernardi and Tim Herlihy serve as executive producers.